I love making cookies. There something about having to keep a close eye on the oven, the anticipation of the perfect time to pull them from the oven. Not too early, but never to late. You have to pay close attention. A cookie is not very forgiving if left in for a minutes or two too long. Those minutes can make or break a great cookie. OS baking them is , to me anyway, like a form of meditation. You can’t be distracted, thinking about things like “who came up with the name Banana Republic and then used it for a clothing store?”, or looking up “ large metal rolling balls”. No, you need to pay attention to cookies, or else your cookies might burn. But don’t let that scare you, and really, you can totally think of all the random, but important, things you want while baking, just use a timer or think those thoughts while watching the oven. These cookies are the cookies that you want to make. A cookie yes, but almost like little soft cakes, full of chocolate chips and pumpkin seeds and warm spices to elevate the pumpkiness of the pumpkin. 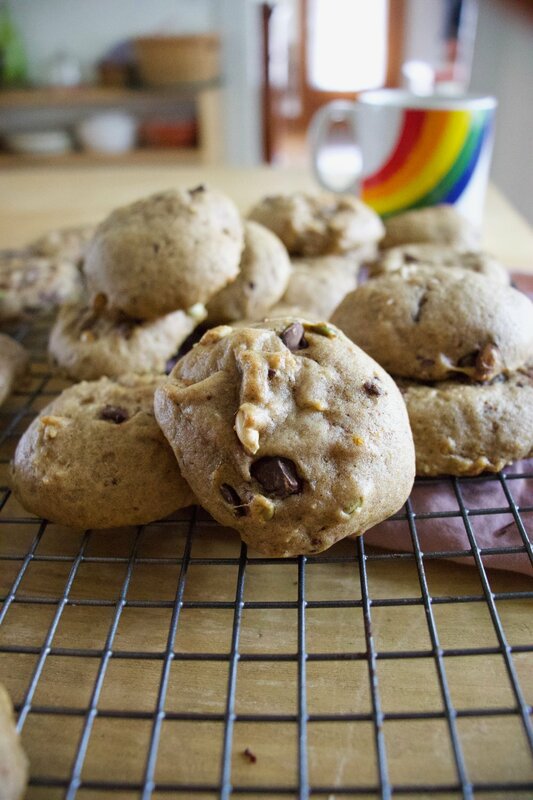 A perfect cookie to bake when you are freezing and want nothing else then to sit in front of a warm oven, spacing out, and revealing in the smell of a fall kitchen. Fall pro tip. Place outwear in the kitchen while baking. I had my jacket on a stool close by while the cookies were baking and even now, a few days later, it still smell like cookies. The stuff. Brown and granulated sugar, flour with salt, cinnamon, allspice ,nutmeg, and baking soda and baking powder. 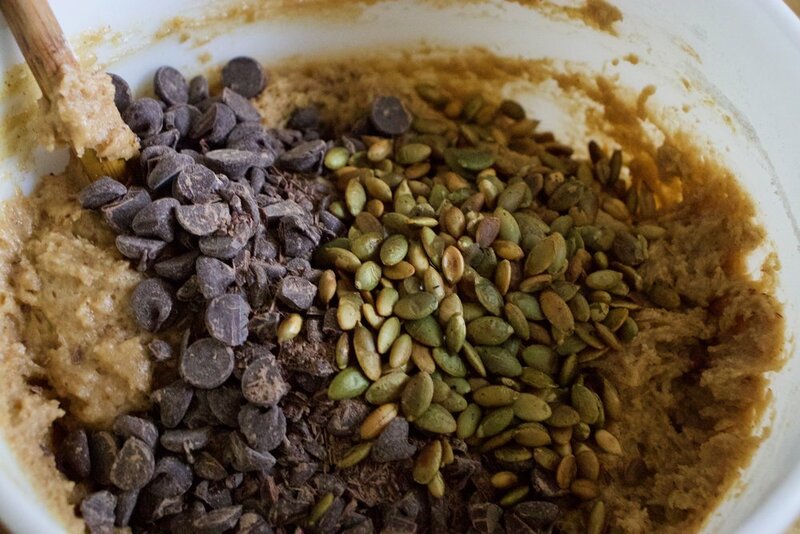 Pumpkin puree vanilla extract, canola oil, chocolate chips, and toasted pumpkin seeds. Mix the sugars, oil, vanilla, and pumpkin puree together until completely incorporated. Add dry to wet. Mix gently, until just incorporated. A now you have cookie batter. But wait, can’t forget the chocolate and seeds. I like to give the chocolate chips a rough chop to make the chips a bit smaller. You can skip this step or just use small chips if you want. 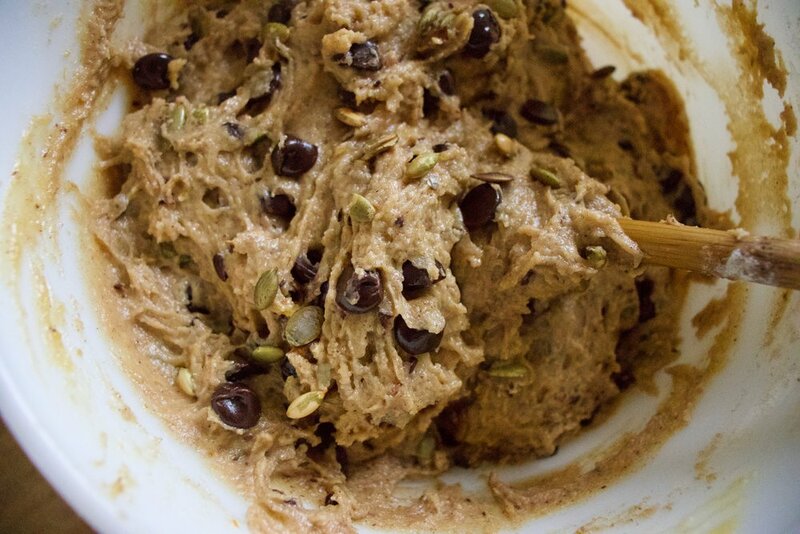 Chocolate chips and toasted pumpkin seeds go into batter. After a gentle mix, it’s time bake. Into the oven and out of the oven. Bakes to a plump golden brown perfection. All the cookies cooling on a wire rack like all cookies should. Cookies for you and cookie to share, if you are nice like that. In a large bowl, mix together the sugars, purlin puree, oil, and vanilla until completely incorporated. 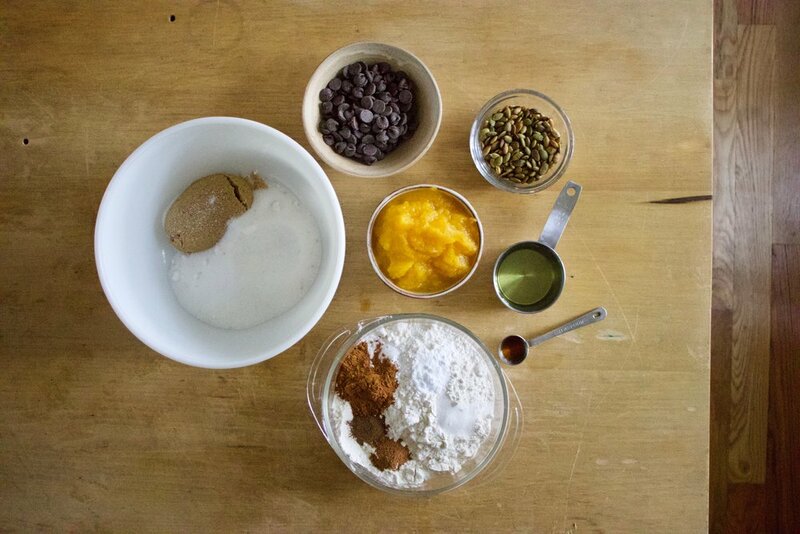 In a smaller bowl, whisk together the flour, baking soda and baking powder, salt, all spice, cinnamon, and nutmeg. Once whisk, dump into the bowl with the wet gas gently mix together until just incorporated. Do not over mix. Dump your chocolate ships onto cutting board and give them a rough chop just to break some of the chips apart. (or use small chips) Add the chop chocolate and the toasted pumpkin seeds to the batter and gently fold them, just to even distribute them. Line being sheets with either parchment or use a splat mat and scoop equal size ball of dough onto the baking sheets. Leave enough room for the cookie to rise and spread. 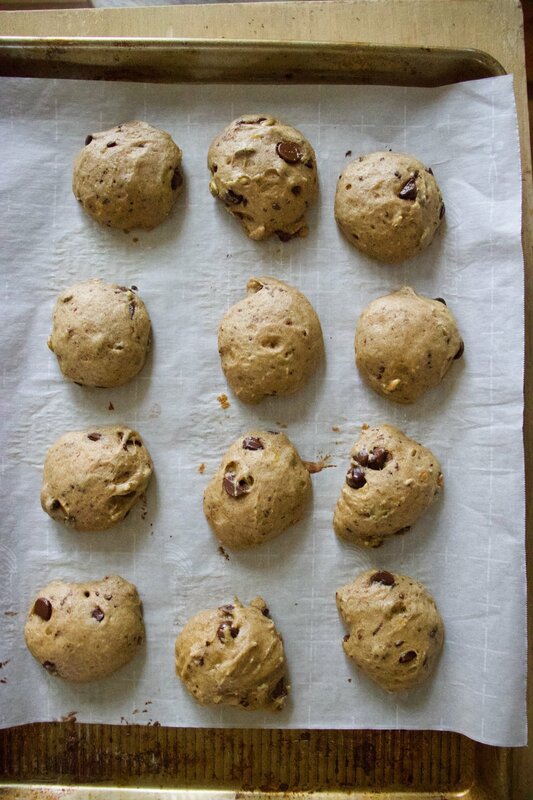 Place baking sheets into oven and bake fir 12-14 minutes or until the cookies have risen, are golden brown, and a tester stuck into the middle of a cookie comes out clean. Remove from oven and place the cookies on a wire rack to cool. Any not eaten cookies should be store in an air tight container and can be left out at room temperature for a day or two but should be refrigerated or frozen for longer storage. The mr likes to eat them straight out of the freezer.